Macroeconomics of Climate Change in a Dualistic Economy: A Regional General Equilibrium Analysis generates significant, genuinely novel insights about dual economies and sustainable economic growth. These insights are generalize-able and applicable worldwide. The authors overcome existing limitations in general equilibrium modeling. By concentrating on tensions between green growth and dualism, they consider the global efforts against climate change and opposition by specific countries based on economic development needs. 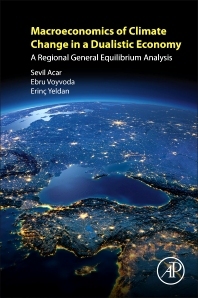 Using Turkey as their primary example, they address these two most discussed and difficult issues related to policy setting, blazing a path for those seeking an applied economic research framework to study such economic considerations. Sevil Acar joined the School of Applied Disciplines at Boğaziçi University in September 2018. She has acted as the director of the Centre for Energy and Environment Research and the chair of the Economics Department at Altınbaş University. Her research focuses on environmental and resource economics, particularly on natural capital accounting, sustainable development indicators, climate change, and the resource curse. Dr. Sevil is a lead author for the Intergovernmental Science-Policy Platform on Biodiversity and Ecosystem Services (IPBES) Regional Assessment for Europe and Central Asia. Her articles appeared in Structural Change and Economic Dynamics, Ecological Economics, International Review of Environmental and Resource Economics, Ecological Indicators, Energy Policy, and Journal of Environment & Development. Ebru Voyvoda teaches in the Department of Economics at Middle East Technical University. She earned her Ph.D. in Economics from Bilkent University. Her research interests include applied general equilibrium modelling for policy analysis, quantitative methods in macro-economic models, and economic growth. She has written for Economic Modeling, Middle East Development Journal, and the Journal of Policy Modeling, among others. Erinç Yeldan is a professor of economics and the dean of the Faculty of Economics, Social and Administrative Sciences at Bilkent University. He is an executive member of the International Development Economists Associates (IDEAs), New Delhi, and a member of the UN Environment Program (UNEP) International Resource Panel (IRP). Dr. Yeldan’s recent work focuses on development macroeconomics and on empirical, dynamic general equilibrium models with emphasis on the Turkish economy. He was a recipient of Young Scientist Award of the Turkish Academy of Sciences (TÜBA) in 1998. His works have been cited among the list of Top 500 Economists by a research conducted by the European Economic Association.